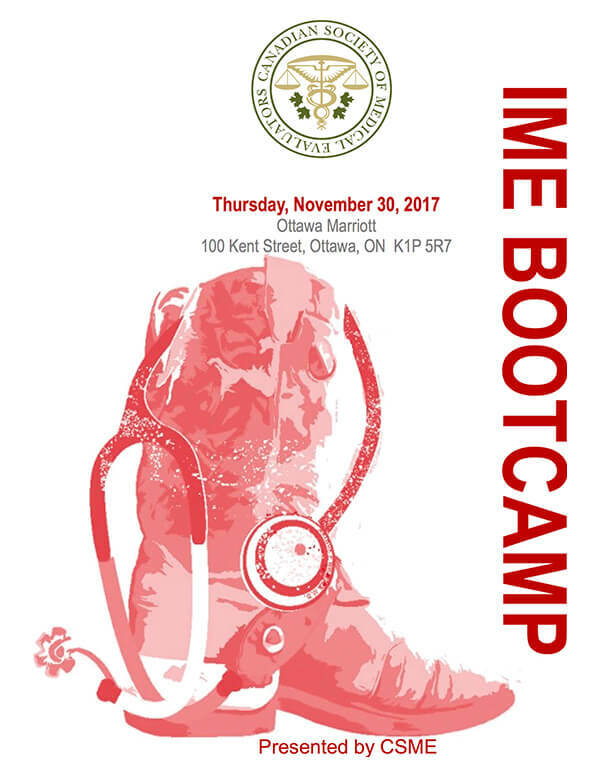 On Thursday, November 30th, 2017, The Canadian Society of Medical Evaluators invites you to attend an IME Bootcamp at the Ottawa Marriott hotel to learn more about the practice ofindependent medical evaluations through interactive workshops. Every stage required to conduct effective and efficient IME’s are reflected in these workshops. There will be ten sections in the IME Bootcamp, each discussing the importance of enhancing the confidence and skill set of health care clinicians in this area of practice. Participants will receive multiple checklists where they can report outline samples of their work and discuss topics. You will also have plenty of opportunities to interact with the faculty during morning, lunch, and afternoon breaks. All levels of experience are welcome. Please review the IME Bootcamp brochure below for more details. Through the IME administrative process, be able to learn the critical steps required to produce the best evidence-based practices to perform an IME strategically. Refine the skills and knowledge you need to be able to conduct effective legal tests when developing quality medicolegal reports that will endure judicial proceedings, and educate yourself on how casual analysis is a highly important factor with regards to liability. Register at www.csme.org or on the last page of the brochure.